When I was a kid I used to love going to the store with my mom. I could always manage to harvest a few more goodies if I went. But the best part was going to the bakery and getting a free cookie. The free cookies were always located in the same area as the doughnuts. It’s a perfect distribution strategy. We’ll give the kids a free cookie and they’ll convince their parents to buy a dozen doughnuts. Also, that free cookie gives kids, who are very persuasive, a reason to go to the store. Nicely done, grocery stores! Nicely done. This week you’ll choose the most effective channel to get your product from the warehouse to the consumer. Or your service from the kitchen table to the contract. What is the best way to get to your target market? You’re about to find out. A marketing channel, also referred to as a distribution channel, is the network of organizations that gets your product from your hands to in front of the consumer’s eyes. In other words, it creates time, place and possession utilities – enabling consumers to have products available when and where they want and to actually take possession of them. The channel length is the number of organizations that your product passes through before it gets to the consumer. This number is referred to in terms of levels. For instance, a two-level distribution channel is when you sell your product directly to the consumer. A five-level channel might include you selling to an agent, who sells to a wholesaler, who sells to a retailer, who sells to the consumer. Maximizing distribution – By lengthening your distribution channel, you have a better chance of reaching more of your target market. For example, without dealerships Toyota would only be able to sell their cars from their manufacturing plants. This would severely limit their capacity to reach the consumer. Minimizing costs – Every level of your distribution channel must receive their cut. Or else they wouldn’t have an incentive to sell it to the next level. That’s why manufacturer’s sales are always great deals for the consumer. The shorter the channel, the more you minimize costs. For example, Verizon sells their phones primarily through their retail outlets or their website. They also sell through third-party retailers like Wal-Mart, but they minimize costs when their marketing channel is shorter. Retaining control – The longer your marketing channel, the less control you have over your product. For example, if Subway made sandwiches and sold them to a wholesaler who sold them to a retailer, Subway would have no control over the presentation of their product. Instead, they make it fresh right in front of the consumer so they completely control the consumer experience. Maximizing distribution, minimizing costs and retaining control creates a tradeoff when considering the length of your distribution channel. As an entrepreneur, you want to have the shortest possible distribution channel. If you sell 300 widgets through a 3-level distribution channel (e.g. You -> Wholesaler -> Retailer), then each level will take a 33% cut. If you can sell more than 100 widgets directly to the consumer, then it’s best to cut the out the ‘middle-men’. If you can’t, then you should lengthen the channel to maximize profits. 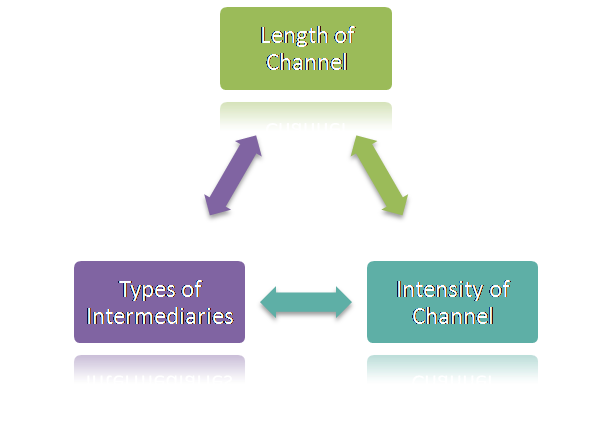 Channel intensity refers to the number of intermediaries at each level of the marketing channel. For instance, you might sell to one wholesaler who sells to two retailers. Or, you might sell to ten wholesalers who sell to 200 retailers. The intensity of the channel structure is described in three ways: intensive, selective or exclusive. Intensive distribution – Selling through as many intermediaries as possible. Convenience products, like Coke, are intensively distributed. For example, if Verizon sold calling cards, they would use an intensive distribution strategy. Selective distribution – Selling through relatively few intermediaries. These are typically products that consumers seek out, like Levi’s jeans. For example, Toyota doesn’t actively try to sell their cars to junky, used car dealerships because this would tarnish their brand. Exclusive distribution – Selling exclusively through one or just a few retailers. Typically high-end products use an exclusive distribution strategy, like Rolex. For example, if there was a brand of smoothie that is only sold at Subway, that would be an exclusive agreement between two interdependent parties. The final dimension of the marketing channel refers to the different types of intermediaries that can be used at the different levels of the channel. This is the part of the distribution strategy where you get to be, and must be creative. For instance, if you’re selling a granola bar, don’t limit yourself to grocery stores. Start thinking about where your target market typically shops. People who eat granola bars are typically outdoorsy. So you should try to sell them at REI or Cabela’s. If you got here without being subscribed to “Entrepreneur’s First Marketing Plan”, you’re missing out! This is the ninth week in a 10-week series that will walk you through developing a comprehensive marketing strategy for your start-up business. If you’re not already a subscriber, click here to learn more about the free course.